For the patrol vessel, see HMCS Goose Bay (MM 707). 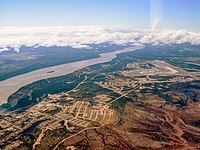 Happy Valley-Goose Bay (Inuit: Vâli) is a town in the province of Newfoundland and Labrador, Canada. Located in the central part of Labrador on the coast of Lake Melville and the Grand River, Happy Valley-Goose Bay is the largest population centre in that region. Incorporated in 1973, it comprises the former town of Happy Valley and the Local Improvement District of Goose Bay. Built on a large sandy plateau in 1941, the town is home to the largest military air base in northeastern North America[clarification needed], CFB Goose Bay. In the summer of 1941, Eric Fry, an employee of the Canadian Department of Mines and Resources on loan to the Royal Canadian Air Force, selected a large sandy plateau near the mouth of the Goose River to build the Goose Bay Air Force Base. Docking facilities for transportation of goods and personnel were built at Terrington Basin. Goose Air Base became a landing and refuelling stop for the Atlantic Ferry route. Soon after the site was selected, men from the coast of Labrador began working on the base. With World War II in bloom, it took only five months to build an operational military airport on the leased territory. The first settlers to the area came from coastal Labrador to work with McNamara Construction Company, which was contracted to build the Goose Bay Air Force Base. Their first choice was Otter Creek, where they were told that it would have been too close to the base. A new location was chosen based upon the requirement to be at least five miles (8 km) from the base. In 1942, a new site was chosen that was first called Refugee Cove; it was not until 1955 that it eventually was renamed Happy Valley. The first three families to arrive to work at the construction of the base were the Saunders from Davis Inlet, the Broomfields from Big Bay, and the Perraults from Makkovik. Happy Valley's first school was operated by a Mrs. Perrault from her home until 1946, when the Royal Canadian Air Force donated a building. The old one-room school was bought by Bella and Clarence Brown in the early 1962 and turned into a family residence. In 1949, the Air Force donated a second building which became the North Star School. Mrs. Perrault became Happy Valley's first librarian also. Bella Brown took over as Happy Valley's librarian when the North Star School's second building was donated as the new library. The Grenfell Mission operated the first medical facilities when it opened a nursing station in 1951. In 1963, the provincial government built Paddon Memorial Hospital. Happy Valley-Goose Bay lies at the southwest end of Lake Melville near the mouth of the Churchill River. The town is located on the southern shore of a peninsula created by Terrington Basin to the north and Goose Bay at the south. Happy Valley-Goose Bay displays a humid continental climate (Köppen Dfb) bordering on a subarctic climate (Köppen Dfc), marked by significant snowfall in the winter, which has average highs around −12 °C (10 °F). Summer highs, on the other hand, average 20 °C (68 °F). The average high temperature stays below freezing for five months of the year and the low does so for eight months. Snowfall averages nearly 460 centimetres (180 in) per year, and occurs in all months except July and August. Precipitation, at nearly 950 millimetres (37.4 in), is significant year-round and is heavy for a continental climate at its latitude. CFB Goose Bay has seen a reduction of NATO low-level tactical flight training in the past decade, and the town is facing an uncertain future as the federal government has reduced the number of permanent Royal Canadian Air Force personnel to fewer than 100 all-ranks. The last NATO nations to use CFB Goose Bay for flight training, Germany and Italy, did not renew their leases after terminating in early 2006. The runway at Happy Valley-Goose Bay was also an alternate, but unused, landing site for the now-decommissioned NASA space shuttle, because of its size and length. Prior to its amalgamation with Happy Valley, the Local Improvement District of Goose Bay was set up in 1970 and included an area called Spruce Park and the Canadian Department of Transport Housing areas. It grew to include other areas of the base until 1973, when it comprised all of the base area. By 1945, the population of Happy Valley reached 229 people, mostly workers who serviced the base. According to records kept by the newly organized United Church, in 1953 there were 116 families in the whole community, which had one UC school. About 50 families were United Church; 25 were Anglican, 25 Moravian, 14 Pentecostal and 2 Catholic. By 1956, the population was 1,145, and by 1961, it had risen to 2,861, then doubled by 1966 to 4,215. Before the community of Happy Valley amalgamated with the Local Improvement District of Goose Bay, the population was 4,937, while Goose Bay's population was 496. According to the Government of Canada's 2006 census, the community of Happy Valley-Goose Bay has a population of 7,572. This represents a 5.0% decrease from the 2001 population of 7,969. According to the same statistics, the median age of the community is 35.7 years, with 79.9% of the population being above the age of 15 (compared with the provincial median age of 41.7 and 84.5%). In 2016, at 51%, the slight majority of the population was still Euro Canadian, but the percentage dropped 12.5% from 2006. There is also a large population of aboriginal peoples, at approximately 45% of the population, which marked an increase of 8.8% from 2006 to 2016. Other sizable ethnic groups present in Happy Valley-Goose Bay are Filipino Canadians (1.8%) and Indo-Canadians (1.1%). The community is largely Protestant, at 73.9%, with a Catholic minority at 20.1%. About 1% of the population claims other religions, and 5% claim "no religious affiliation." 3,380 people in Happy Valley-Goose Bay identify as Métis or Inuit. Considering most Métis in the community are of partial Inuit descent, this gives Happy Valley-Goose Bay the second-highest population of people of Inuit descent of any municipality in Canada after Iqaluit. Despite this, less than 300 people in the community can speak an Aboriginal language. Happy Valley and Goose Bay are connected by the Trans-Labrador Highway with Labrador City and Baie-Comeau in Quebec. The road was extended south to link with an existing road from the Blanc Sablon-St Barbe ferry. It opened in December 2009. Prior to 1954, hardly any licence plates were issued to Labrador communities except for Happy Valley and the Goose Bay area. A series of small plates were issued to help fund road development. It was not until the mid-1960s that all of Labrador started using regular Newfoundland licence plates. Since 1992, the road from Baie-Comeau to Wabush was connected to an open route year-round to Happy Valley-Goose Bay. The town was serviced by boat and container ship to the ports from Newfoundland and the port of Montreal. Most of the town's supplies were transported by container vessels brought to the docking facilities located at Terrington Basin. These facilities were operated by Transport Canada. The shipping season usually lasted from June to December. In the summer, a ferry service connects Happy Valley-Goose Bay with Cartwright. Air Canada and Eastern Provincial Airways were the first air carriers in the area to carry passengers from outside the area into CFB Goose Bay. Labrador Airways Limited provided air transportation to local communities. Located at Otter Creek is a seaplane base that also provided airlifts to local communities and tourist lodges in the interior of Labrador. Newfoundland's Namescape Unpublished manuscript, Floreen Carter, Phelps Publishing, London Ont. ^ "VOCM - Mayor of Happy Valley-Goose Bay John Hickey Dies in Hospital". Vocm.com. Retrieved 9 August 2018. ^ a b c d "Goose A". Canadian Climate Normals 1981–2010. Environment Canada. Retrieved 23 May 2014. ^ "Happy Valley-Goose Bay, Newfoundland and Labrador (Town) Census Subdivision". Community Profiles. Statistics Canada. ^ "2016 Census Profile". 12.statcan.gc.ca. ^ "2011 Census Population, Census Consolidated Subdivisions (CCS) by Community : Newfoundland and Labrador" (PDF). Stats.gov.nl.ca. Retrieved 9 August 2018. ^ "History of Newfoundland Licence Plates". Canplates.com. Retrieved 9 August 2018. Happy Valley-Goose Bay - Encyclopedia of Newfoundland and Labrador, vol. 2, p. 797-799. This page was last edited on 5 March 2019, at 11:41 (UTC).